I must confess I have a soft spot for AC Cobra's especially when they look like the one above. This is a very beautiful car with a great history. It was auctioned off last year but was passed in at US$790,000. WOW! Wouldn't you like to be the guy that discovered this in your granddads shed. I don't think anyone did by the way. Bit of editorial license there. 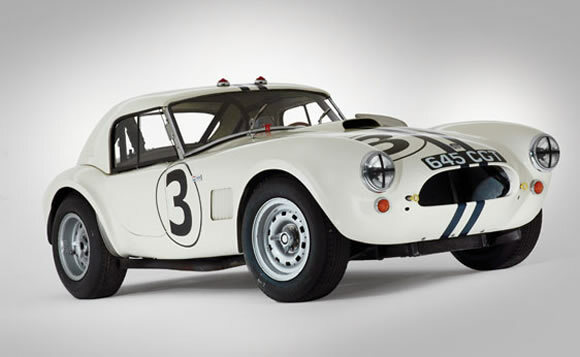 The AC Cobra and Carroll Shelby helped Ford take on Ferrari and beat them where it hurt, Le Mans in 1964. Light with a 340hp 289 V8 it still took quite a bit of work to get the AC Cobra ready for it's biggest challenge because it had to be homologated International Competition. So in went a rollcage, on went a roof, new windscreen, safety equipment and a lot of suspension work. The suspension work made the biggest difference though because these things could really motor and the standard ones were a real handful. These days I think cars are going for big money if they have a story, like this one. I can't see the point of having a cool car you dreamed about owning and then not driving it like it was designed for. You would be hard pressed to find an original AC Cobra now but the licensed built ones are great and probably a lot lighter on the pocket. A beautiful car that really show the“Cavallino Rampante” boys a thing or two.